Bobby Allison the brother of Donnie and father of Davey and Clifford Allison had a long and great racing career spanning close to three decades. Probably one of his most famous wins was when he and son Davey finished first and second. They were the first father and son combination to accomplish this feat. Bobby won the Winston Cup Championship in 1983 starting 30 races and picking up 6 wins to hold off Darrell Waltrip, who also had 6 wins, 4,667 to 4,620 points. Bobby's first win of 1983 was the Richmond 400 followed by his next win at the Mason-Dixon 500. His third victory was the Van Scoy Diamond Mine 500 at Pocono and he grabbed his fourth, fifth and sixth victory back-to-back in the Southern 500 , Wrangler Sanforset 400 and the Budweiser 500. In 1982 Bobby earned eight victories with one of those being the Daytona 500, one of three trips to victory lane in the Daytona 500. He also made it to victory lane at Daytona 500 in 1978 and 1988. Bobby had three second place finishes at the Daytona 500 as well, they were in 1970, 1972 and 1981. 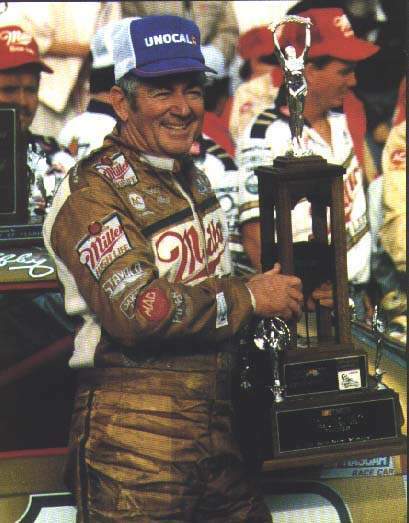 Bobby Allison is third on the all-time win list with 85 victories. He was runner-up to the Winston Cup Champion four times. One of those came in 1981 when he lost to Darrell Waltrip by 53 points. In 1982 he lost again to Waltrip, this time by 72 points. In 1970 Bobby Allison lost to Bobby Isaac by 51 points and in 1972 Richard Petty beat Bobby by 228 points. Bobby is a six time winner of the Driver of the Year Award 1971-1973 and 1981-1983. He earned two Olsonite Driver of the Year Awards, 1972 and 1983. He was the 1980 IROC Champion and received the NASCAR Award of Excellence in 1989. In 1998 he was named one of NASCAR's 50 Greatest Drivers. He was inducted into the International Motorsport Hall of Fame in 1993 and was inducted into the National Motorsport Press Association Hall of Fame in 1993. In 1994 he was inducted into the North Carolina Auto Racing Hall of Fame. In July 1992, Bobby's youngest son Clifford was practicing for a Busch Grand National race at Michigan Speedway. When his car crashed head on into the turn three wall, track rescue workers sprang to action. Bobby rushed from the pit area to make his way out to his son's car. It was too late; Clifford died instantly. It seemed like 1993 was going to be a bounce back year for Bobby. Raybestos Brakes had departed as a sponsor but Meineke stepped in. The feeling was that Hut Stricklin could win a race. However, it wasn't to be. Hut was released and Jimmy Spencer stepped in. The series went to Louden, New Hampshire for the inaugural Winston Cup race there. Davey had gotten his pilot's license earlier in the month and after finishing third, flew back home with Bobby. On that plane trip after the New Hampshire race, they talked about the future. Davey talked about his goals in racing and what he wanted to accomplish in the sport. It was the last time that Bobby saw his son alive. On that Tuesday, Davey and Red Farmer went to Talladega Superspeedway to see David Bonnett test a car. Davey's helicopter crashed on the infield of the track and he died shortly thereafter. Despite the tragedy, Bobby pressed on. He had to pay his own medical bills from the 1988 career-ending wreck so he sold race machinery but the downward spiral continued. Meineke left as his primary sponsor for his race team. He brought in Chuck Brown to drive his un-sponsored car in 1994. His wife Judy filed for divorce in 1996. Ed Hinton wrote in Sports Illustrated in February 1997 that Bobby would take off in his plane or go and visit friends while Judy answered the door and heard the fans stories about her sons that died in the sport that her husband loved. Bobby's race team had begun to bounce back securing the sponsorship of Straight Arrow with driver Derrike Cope. However, the team operated on a shoestring budget for a few years and late in 1996, Bobby realized that securing a sponsor for 1997 would be almost impossible. So... the team shut down.